Wish you could build your own music devices? Our friend Jason Kramer points to the Critter Board, a “hardware platform for creating self-contained electronic music devices.” The board looks great: it’s based on the 32-bit 58 MHz ARM microcontroller and programmed in C, like some other boards, but features a unique setup perfect for making musical toys: 21 I/O connections for adding knobs, sensors, LEDs, and the like, flash memory support for storing sounds, and a line out jack. 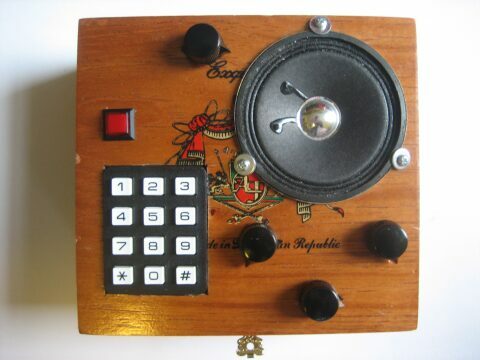 just got mine today, I actually bought one of Owen’s one-off projects touted as a tutorial to demonstrate a possible application for them; the 4 Voice Cigar Box Synth. It sounds pretty amazing, but apparently it can do way more just make sounds. The board itself is US$64.95, including the flash card socket, and can be programmed via any Mac, Windows, or Linux machine using the USB programmer. You can also buy the pre-built FM synth for US$190, but where’s the fun in that? And more projects from these guys are on the way — stay tuned!